The Axion Dark Matter Experiment (ADMX) is the world’s first and only experiment to have achieved the necessary sensitivity to “hear” the telltale signs of dark matter axions. This technological breakthrough is the result of more than 30 years of research and development, with the latest piece of the puzzle coming in the form of a quantum-enabled device that allows ADMX to listen for axions more closely than any experiment ever built. 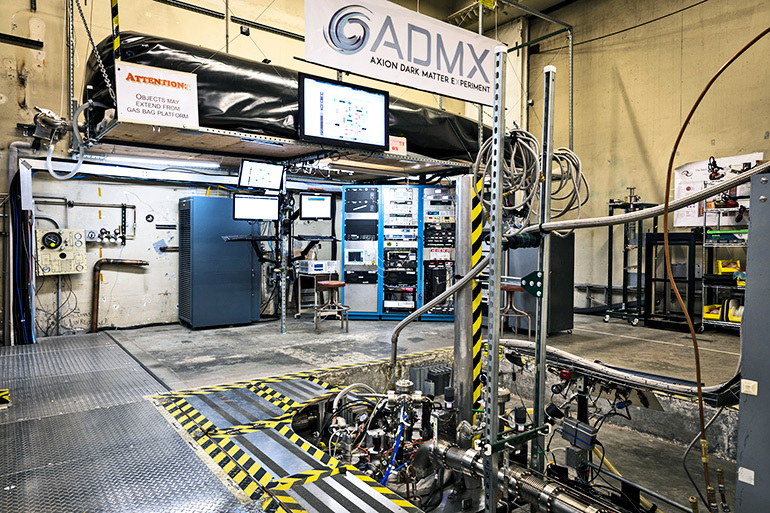 ADMX is based at the University of Washington and managed by the US Department of Energy’s Fermi National Accelerator Laboratory. This new result, the first from the second-generation run of ADMX, sets limits on a small range of frequencies where axions may be hiding, and sets the stage for a wider search in the coming years. ADMX is an axion haloscope—essentially a large, low-noise, radio receiver, which scientists tune to different frequencies and listen to find the axion signal frequency. Axions almost never interact with matter, but with the aid of a strong magnetic field and a cold, dark, properly tuned, reflective box, ADMX can “hear” photons created when axions convert into electromagnetic waves inside the detector. Invented by Pierre Sikivie of the University of Florida in 1983, the detection method might make the “invisible axion” visible. Sikivie also came up with the notion that galactic halos could be made of axions. 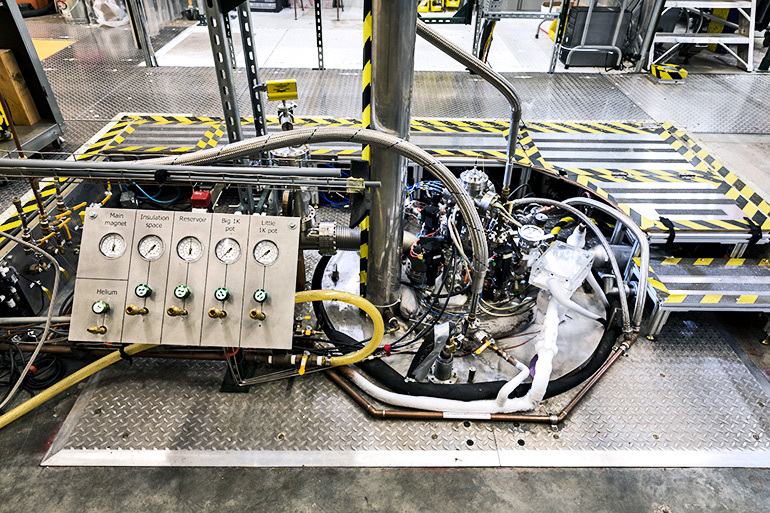 Pioneering experiments and analyses by a collaboration of Fermilab, the University of Rochester, and the US Department of Energy’s Brookhaven National Laboratory, as well as scientists at the University of Florida, demonstrated the practicality of the experiment. This led to the construction in the late 1990s of a large-scale detector at the US Department of Energy’s Lawrence Livermore National Laboratory that is the basis of the current ADMX. Fixing thermal radiation noise is easy: a refrigeration system cools the detector down to 0.1 Kelvin (roughly -460 degrees Fahrenheit). But eliminating the noise from electronics proved more difficult. The first runs of ADMX used standard transistor amplifiers. Then, the researchers connected with John Clarke, a professor at the University of California, Berkeley, who developed a quantum-limited amplifier for the experiment. This much quieter technology, combined with the refrigeration unit, reduces the noise by a significant enough level that the signal, should ADMX discover one, will come through loud and clear. “The initial versions of this experiment, with transistor-based amplifiers would have taken hundreds of years to scan the most likely range of axion masses. With the new superconducting detectors we can search the same range on timescales of only a few years,” says Gianpaolo Carosi, co-spokesperson for ADMX and scientist at Lawrence Livermore National Laboratory. The researchers report their results in the journal Physical Review Letters. The ADMX collaboration includes scientists from Fermilab; the University of Washington; Lawrence Livermore National Laboratory; Pacific Northwest National Laboratory; Los Alamos National Laboratory; the National Radio Astronomy Observatory; the University of California, Berkeley; the University of Chicago; the University of Florida; and the University of Sheffield. The US Department of Energy Office of Science, the Heising-Simons Foundation, and research and development programs at the US DOE’s Lawrence Livermore National Laboratory and the US DOE’s Pacific Northwest National Laboratory supported the research.